Of all the new iPad apps available when Apple released its new device on April 3, the ones I most wanted to try were the trio of iWork apps: Pages, Numbers, and Keynote. If the iPad is ever to transition from a primarily content consuming device to one that is equally adept at content creation, these are the apps that will likely lead the charge. Thus, I was eager to find out just how well they worked. One burning question was: How easily can I share an iWork document between an iPad and my Mac—especially if I intend to edit the document on both platforms, switching back and forth multiple times? The answer to this question turns out to be: Not especially easily… and sometimes not well at all. As I have written elsewhere, simply exchanging an iWork document between an iPad and a Mac is far less simple and considerably more irritating that it ought to be. Apple’s own support articles sound a warning bell. You know to expect trouble when a support article cites Step 1 for copying “a file to Keynote, Pages, or Numbers for iPad” as: “Follow steps 1–6 in iPad: About File Sharing.” Adding more confusion, the referenced second article doesn’t even list a relevant Step 6. Copying an iWork document from your Mac to your iPad may be only half the battle. As it turns out, the import process will often strip critical data from the document. All of the iWork apps have problems in this regard. For simplicity, I will focus only on Keynote here. 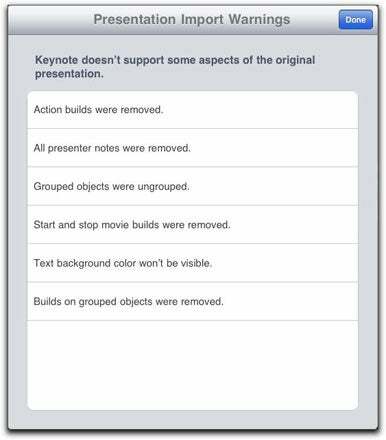 An Apple Keynote for iPad FAQ highlights the main problems: Presenter Notes and Comments are not imported; Grouped objects are ungrouped; Recorded or embedded audio is not imported. The iPad may also replace fonts if the ones in your document are not among the 40 fonts that the iPad supports. As an example of how a document can be modified, the message below popped up on my iPad after I imported the Keynote file from my recent Macworld Expo session. As you can guess, the imported presentation displayed significantly differently on my iPad than on my Mac—and not in a good way. The final kicker is that if I return the iPad version of the document back to my Mac, the stripped out attributes remain missing. There now seems no point in editing an imported Keynote document on my iPad for later file sharing back to my Mac—unless I am willing to replace the original Mac file with the stripped-down iPad copy. File sharing via iWork has become an almost useless option—other than for a unidirectional transfer. Ideally, even if iWork apps can’t display all the attributes of a Mac version of a document, they should at least not strip those attributes out. These are not bugs in iWork. They are limitations of a 1.0 version of the software. But they need fixing if iWork for the iPad is ever to be much more than a “proof of concept.” I remain optimistic. Apple has a great track record for substantially improving its products over time. iWork for the iPad will be no exception.